Cheech's sitcom, which comes to Fox this fall, is based on the British comedy, The Kumars. The link below describes each episode of The Kumars and gives you a better understanding of what The Ortegas will be like. Note: It was originally supposed to be on NBC, but later switched to Fox. Some of Cheech Marin's art will be on display at the "Chicano Now: American Expressions exhibit." The event takes place at the Insight Museum in El Paso, TX and will last until January 4th, 2004. The Eureka Theater in Eureka, California will be showing Up in Smoke every Thursday, Friday and Saturday in July. This is your chance to see Up in Smoke on the big screen. The 1938 art deco theater is undergoing major restorations and will feature killer sound systems, digital projection, catering kitchen and dance floor. The tickets are only $5 and the proceeds will be used towards the theater improvements. 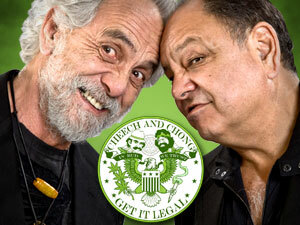 Cheech + Chong = Murder? Apparently, murderers are big C & C fans. WFSB CBS News ran the following report about some murderer being arrested. "It was here in the cellar, say investigators, that rudolph grew high-grade marijuana and sold it to customers in nashville. Strangely enough, the man police say is responsible for killing two and injuring over 100 others enjoyed spending his free time getting high and laughing at cheech and chong movies. "